Hillary Clinton has pulled in more than $1 million in donations after seeking money for her "resistance" group to help with family separations at the the U.S. border that she claimed would be doled out to a number of other left-leaning organizations. "What's happening to families at the border right now is horrific: Nursing infants ripped away from their mothers. Parents told their toddlers are being taken to bathe or play, only to realize hours later that they aren't coming back. Children incarcerated in warehouses and, according to more than one account, kept in cages," Clinton wrote Monday in a fundraising email to supporters. "This is a moral and humanitarian crisis. Everyone of us who has ever held a child in their arms, and every human being with a sense of compassion and decency should be outraged." 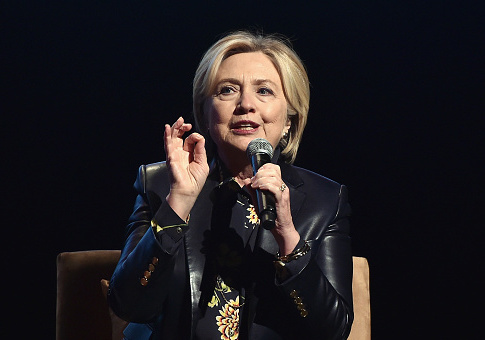 Clinton followed up on Thursday by announcing that her group, Onward Together, had exceeded $1 million in contributions and that the money would be split amongst left-leaning activist groups. "Since I reached out to ask this community to step up and support the groups working to protect and reunite families that have been separated at the border, you've raised more than $1 million that will be split between the teams at the American Civil Liberties Union, the Asylum Seeker Advocacy Project, the Florence Immigrant and Refugee Rights Project, Human Rights First, Kids in Need of Defense, La Union del Pueblo Entero, the Refugee and Immigrant Center for Education and Legal Services, United We Dream Action, We Belong Together, and the Women's Refugee Commission," Clinton wrote in an email. The 2016 presidential runner up also urged supporters to join planned rallies across the country to protest President Donald Trump's zero-tolerance policy toward illegal border crossings. Trump on Wednesday signed an executive order to keep families together that are detained for entering the U.S. illegally—an order that Clinton criticized in her message as "not a solution" to the family-separation issue. Onward Together was formed in April of last year after Clinton said she wanted to be a part of the "resistance" to counter Trump's agenda. The group seeks to provide financial support, strategic leadership guidance, recognition through endorsements, or the mobilization of its members to support its partner organizations. Clinton's group is a 501 (c)(4) "social welfare" organization that is not required to disclose its donors, and has yet to file a financial disclosure form. Last year, Clinton sent $800,000 from her campaign funds to the group. The Democratic National Committee and the Democratic Congressional Campaign Committee have also combined to pay the group millions for its email lists. This entry was posted in Politics and tagged Hillary Clinton, Immigration. Bookmark the permalink.